Crowdfunding projects via sites like Kickstarter and Indiegogo have been increasing in popularity and some would say hit the mainstream. No disrespect to my wife, but she’s not an early adopter and it wasn’t until recently a mini ice machine showed up at our door that I realized she knew and took part in Kickstarter. By contrast, I’ve been using Kickstarter since it launched 2009/2010 and Indiegogo since 2014. In that time, for all the bad press these sites sometimes get, I’ve had a really good rate of return on my pledges. Roughly 85% of the projects I’ve backed have been delivered to my door and as it turns out my rate of return monetarily has been 83 cents on the dollar (ie for every $1 spent I’ve lost $0.17). 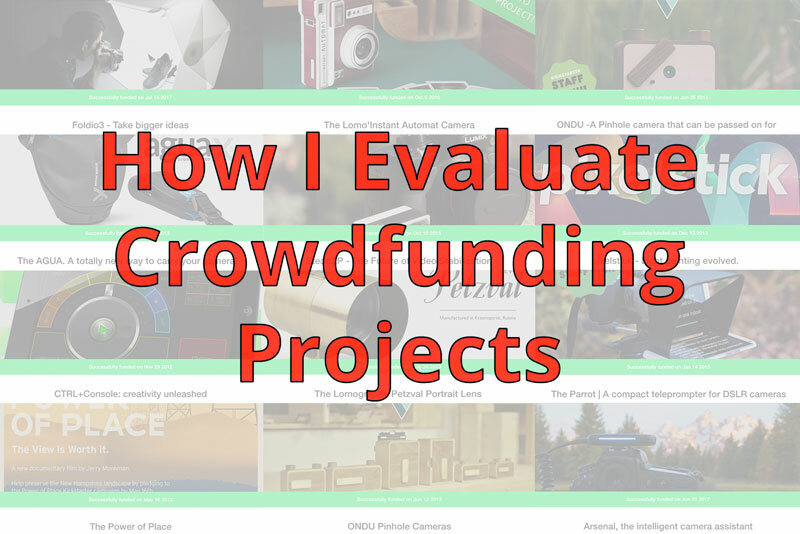 It would seem I’ve backed enough crowdfunded projects that I’d be considered a “super backer”, so I thought I’d share my evaluation process with you to increase the odds you back successful projects. 1. Is this a product I really need and/or will I use more than X times to recoup my cost? I can’t say I absorbed a lot in my college economics course, but I never forgot the discussion about the difference between wanting and needing a product. Be honest with yourself about whether you’re getting something that will be of use to you or if your money will be better spent on essential goods and services. 2. Is the product too good to be true? Or are the project organizers over ambitions? One of the most entertaining aspects of evaluating crowd funded projects is to determine if they’re even possible. Does the product defy physics? (Ex. laser face razor) Figuring out if you’re being sold snake oil is an important part of evaluating a pitch. When in doubt, watch the pitch video a few days later so as to not get swept up by hype and allow yourself time to research the technology/concept behind the product. 3. Is the product dependent on other products to be compatible? If so will this product be obsolete by the time the product ships? (ex. iPhone cases being released after the next generation phone is released, GoPro accessories, etc.) The biggest downside to accessory projects is that the product they’re an accessory for can change faster than the project can execute. Cell phone cases, cell phone lens add-ons and action cameras are all prone to this. For this reason, I rarely back these types of projects. Is This Product Filling A Hole In The Marketplace? 4. Is there already something out there that is equivalent, proven and at a price point I should get instead? If you like gadgets it’s pretty easy to lose sight of the larger marketplace as a whole when browsing crowdfunding sights. When you browse Kickstarter or Indiegogo your frame of reference will be all the projects on that site. One project may seem better in relation to another and when you find one that strikes a nerve your reference point will be set against other sub par projects. Ultimately the “good” project catching your eye may be solved by an equivalent product elsewhere… like Amazon, so do your homework. This is especially true for batteries, chargers and similar accessories. 5. Are there or have there been other crowdsourced projects that are similar and how did they fare? 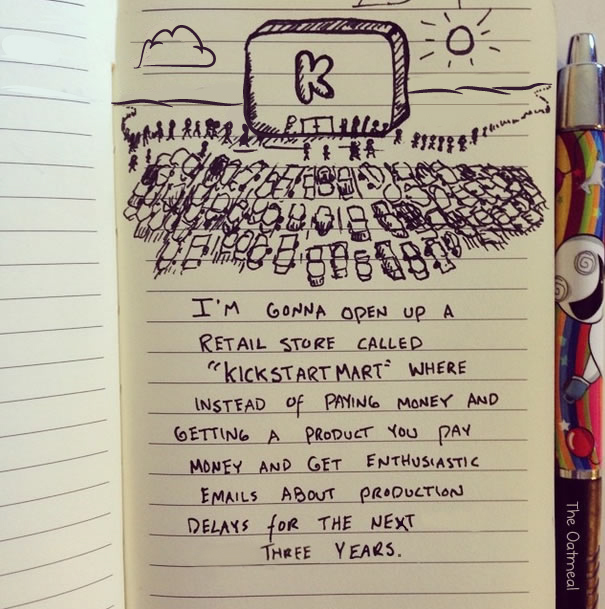 Odds are the products you’ll find on crowdfunding sites will not be one-of-a-kind. Research to see if an equivalent project is on going and/or more likely to be delivered? If you find a similar product that was crowd funded see if it was successful, well reviewed, and/or delivered on time. If a similar project failed in the past investigate why and see if the project you’re considering is repeating the same mistakes. 6. Will this product obsolete itself or be obsoleted by a dependent technology? Sometimes our immediate desires cloud our vision of the future. Some products and technologies cycle faster than upstart companies (ex. operating systems). If you’re backing software (app or desktop program) is it likely to be compatible in 6 to 18 months? Will the company/product you’re backing be faced with an incompatibility and have to pivot resulting in costly delays? 7. When is delivery targeted and what roadblocks are likely to impede that goal? Most projects are required to list “Risks and Challenges”. Don’t gloss over this section and weigh it heavily in your evaluation whether to back the project. Are all the risks and challenges being accounted for? Are some risks being taken too lightly? If these risks don’t match up to the proposed delivery date reconsider backing the project or communicate your concerns to the project team. 8. Will this project bust because of expensive materials or labor costs? Some projects face an uphill battle simply because the project organizers lack an understanding of the cost of materials and labor or have initial quotes unexpectedly changed by vendors mid-project increasing overall costs. Of the many projects I’ve backed, this is one of the most common reasons a project fails. 9. Is there a prototype in existence and has it been reviewed by others? Crowdsourced projects are essentially pre-order campaigns and most crowdsourcing sites require a prototype to be in place before taking pledges. If this is not the case for the project that has caught your eye it’s time to take a harder look and/or reconsider backing it. 10. Is it a known company or are the project organizers well known? Is the company or project organizers known? Sometimes established companies use crowd funding sites as a preorder mechanism. Odds are if they already produce and deliver products you’re going to get what is promised to you. If it’s a lesser known company or team look into the credentials of those running the project you’re interested in. It should not be good enough that a social media or celebrity talking head is the face of the company. In the worst case scenario see if the people behind the project have a bad reputation. Ideally, the person or team assembled for the project that has caught your eye has the appropriate background, skill(s) and network to complete the job. A good idea alone won’t get the job done. 12. Have they successfully completed a Kickstarter or Indiegogo project? Has the company or team behind the project successfully completed other crowd funded projects? Is the project being run by a company that is already established? If the answer to either of these questions is yes, your odds of seeing the promised product go up exponentially. On the flipside, Google the team or team members to see if they’ve tried before and failed under a different company name. Was it delivered on time? If not how late was it? 13. Do they communicate effectively and frequently? Never underestimate the power of good communication. It is important to make sure that backer concerns and expectations are addressed quickly. If project comments are addressed slowly or incompletely that is a big red flag. Also important is the ability of project organizers to address hard questions constructively as it may be telling how they’ll communicate when the project hits some rough patches. If everything looks good to these questions, I strive to back projects at a pledge level that is the best value (ex. early bird pricing or multiple unit orders). Then I swing back in a few days to reevaluate the project. At that point, I either back out or mentally validate I’m making a wise purchase. Note: If you get cold feet about a project you can undo your pledge, without penalty, if the fundraising window is still open. With all this in mind I usually only commit a monetary pledge I’m willing to lose, assuming the project is never executed and delivered. There is never a guarantee a project will be completed and most crowd funding sites insulate themselves legally from liability if a project is a bust. My track record to date is pretty good with 85% of my backed projects being delivered. Again only pledge or spend an amount that you’re willing to lose. In an ideal world, the organizers will have a great deal of experience with engineering and manufacturing, delivering quite quickly after their campaign ends. For those that are trying their hand for the first time, you’re betting they can navigate the process before their funds evaporate. It doesn’t always work out, but when it does it can be a lot of fun. Given my earlier reported rate of return, it could be interpreted that every successful project I’ve backed really cost me 17% more. If I’ve lost 17 cents overall for every dollar spent that could be equated to a 17% premium paid for my successful campaigns. In the macro sense, you could look at it this way but consider my reported numbers cover a span of 7+ years. From year to year the amount I lost, per dollar spent, fluctuates depending on how bold/expensive my pledges were. As it turns out my overall average pledge in this time frame was $132.77. I’d like to think that most of this “premium” is recouped by grabbing the greatest discounted offers with early project pledges (aka early bird pledges). On the other side of the coin, one can make the argument that you’re backing projects for more altruistic purposes to help upstarts get started rather than opportunistically satisfying your consumer urges. In my case, I have backed several projects to help other photographers (photo books, conservation campaigns, etc.) so I’m not backing crowd funded projects just for material goods alone. No matter how you slice it you’re going to have varying degrees of success, but hopefully, my process of evaluating projects helps you avoid scams and/or get the most out of your investment.